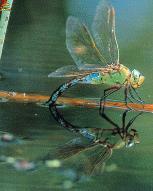 Dragonflies are beautiful water insects that inhabit the Laurel Lake area. Dragonflies have 4 wings. They have been called the fastest flying of all insects. Dragonflies have been reputed to fly as fast as 50 to 60 miles per hour. Dragonflies have large, compound eyes that appear as beads and cover most of their heads. Their 6 legs are covered with spines. 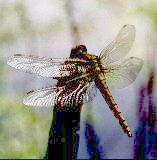 Dragonflies can see motionless objects up to 6 feet away. Dragonflies mate while flying. The female usually dropsher eggs from the air into water or inside stems of aquatic plants. The nymph, young dragonfly, hatches in 5 to 15 days. Nymphs have large bodies, heads, and mouths. The nymph's mouth has a folding lip with a hook-like devise used for trapping prey. The nymph breathes through gills. The dragonfly nymph remains in this stage from 1 to 15 years. During this time, they remain in the water and molts approximately 12 times. Upon completion of the final molt, the nymph crawls out of the water, sheds its skin, and emerges as a dragonfly. Adult dragonflies liveonly a few weeks to a few months.